Kurdish mythology is the collective term for the beliefs and practices of the culturally, ethnically or linguistically related group of ancient peoples who inhabited the Kurdistan mountains of northwestern Zagros, northern Mesopotamia and southeastern Anatolia. This includes their Indo-European pagan religion prior to them converting to Islam, as well the local myths, legends and folklore that they produced after becoming Muslims. Kurdish people originally worshipped a pantheon or class of gods called dêw, which are known as Daeva in English, although these gods were later seen as evil monsters, trolls or giants. They were replaced by the ahurâ gods, known in English as Asura, before they were merged into Ahura Mazda. The Kurds believed in a terrifying dragon that they called ejdîha, which is known as Zahhak in English. In Kurdish mythology, the ancestors of the Kurds fled to the mountains to escape the oppression of a king named Zahhak. It is believed that these people, like Kaveh the Blacksmith who hid in the mountains over the course of history created a Kurdish ethnicity. [better source needed] Mountains, to this day, are still important geographical and symbolic figures in Kurdish life. 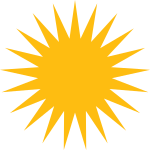 In common with other national myths, Kurdish mythology is used for political aims. The Sasanian king Chosroes II Parvez is highly esteemed in the Kurdish oral tradition, literature and mythology. ^ O'SHEA M. T. Between the map and the reality : some fundamental myths of Kurdish nationalism. ^ "Kurdish Library - Kurdish Museum". Summer 1991. pp. 117–123. This page was last edited on 10 March 2019, at 12:28 (UTC).